Weather is an incredibly important factor in determining when to visit the Riviera Maya, Mexico. The Riviera Maya has some of the most beautiful days you will ever experience with it's cool breezes right off the Caribbean shore. One of the most wonderful things about this semi tropical Riviera Maya is that the current temperatures here are perfect just about year round! You can come anytime of year and swim in the ocean and walk on the beach and be very comfortable. There are not a lot of places like the Riviera Maya so you know whenever you come here you are guaranteed some great weather! You might experience an afternoon shower in the rainy season, but there aren't many days where you can't enjoy the beach and the beautiful sunshine! 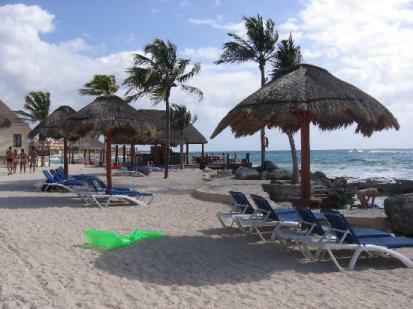 The average yearly temperature and forecast in Cancun, Playa del Carmen and the Riviera Maya is 78 degrees F (25.5C). Feb, Mar, April & May - Springtime in the Riviera Maya! There is only a little bit of rain in these months, but the flowers are blooming. The evenings are a bit cool, but during the day the temperature is mild and comfortable and ranges from 75-82 degrees F.
June, July & August - Hot summer months, up to 95 degrees F with occasional rainfalls. However, it usually just rains for a short time and the sun will come out again. Sept & Oct - Summer heat has cooled off by now and you will enjoy really comfortable 80-87 degrees outside. The humidity is higher so it will feel hotter. It is still perfect for swimming in the ocean. The pool may be a bit cold depending on how hot the days are, but when I have traveled during these months I swam in the pools despite it being a bit colder. Nov, Dec. & Jan - The coolest months in the Riviera Maya. Temperatures can be from 72-80 degrees F. The conditins are very comfortable outside. You can wear normal summer clothing, but in the evenings you may need a light jacket because it tends to get cooler. No matter what time of year it is, it would be helpful to bring a light jacket for the evenings. The sun goes down and so does the temperature. The breeze off the ocean is very strong at night which also cools you down. It is always very helpful to know what a typical day looks like! When I went on my honeymoon, my fiance at the time and I wanted to see when the most affordable time would be to plan our honeymoon in the Riviera so we could stay for a longer period of time. We have noticed whenever we travel during the low season that the resorts seem empty but the climate is perfect! High Season: Mid Dec-March Low Season: May-early Dec. Ocean water is at its warmest in August and September and it starts to cool down in November. Hurricane Season is September through December, so keep this in mind. Are you wondering if the forecast will effect your excursions? Here are some online resources to help you further in your weather search in the Riviera, Cancun and Playa del Carmen. They can give you more detailed info on weather by the hour as well as hurricane info. www.weather.com for general info and helpful 10 day forecasts. www.wunderground.com for Hurricane info and watch local radars.